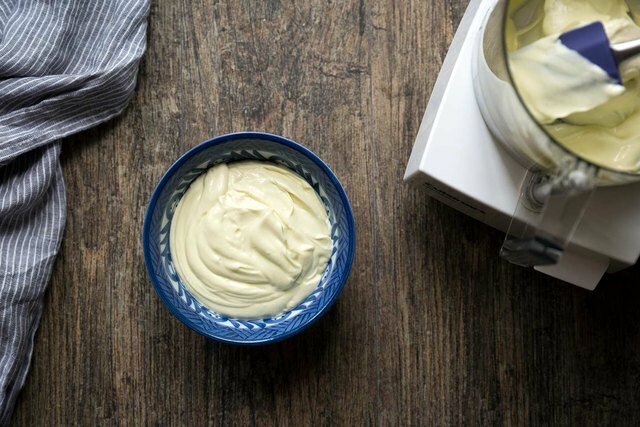 Both homemade mayonnaise and aioli are very easy to prepare at home, and they taste much better than the jarred products available at stores! They come together in mere minutes, and will last for approximately 2 weeks in the refrigerator (though they taste best if consumed within the first week). 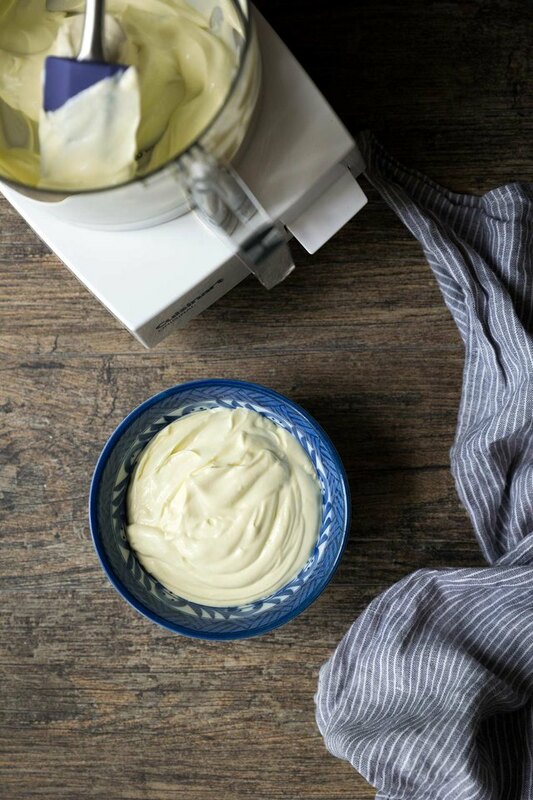 Are you wondering what the difference is between mayonnaise and aioli? Not much! They're made using the exact same process, only aioli is traditionally made with the addition of garlic paste. It's also sometimes flavored with additional ingredients, such as some pesto or Sriracha. I'll get this out of the way immediately: the thing that makes people squeamish about these recipes is that they use raw eggs. Keep this in mind, though: if you've ever ordered anything with aioli at a restaurant, you were served raw eggs. It's OK. 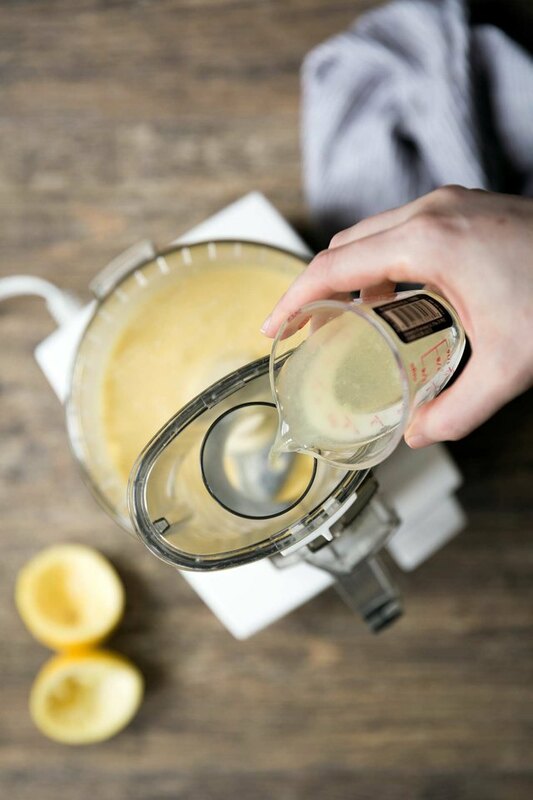 The trick is to use pasteurized eggs whenever possible. They're heated to reduce the risk of food-borne illness in dishes that are not cooked, such as this one. Step 1: Gather your ingredients and tools. In Mastering the Art of French Cooking, Julia Child gives instructions for preparing homemade mayonnaise with a bowl and whisk. 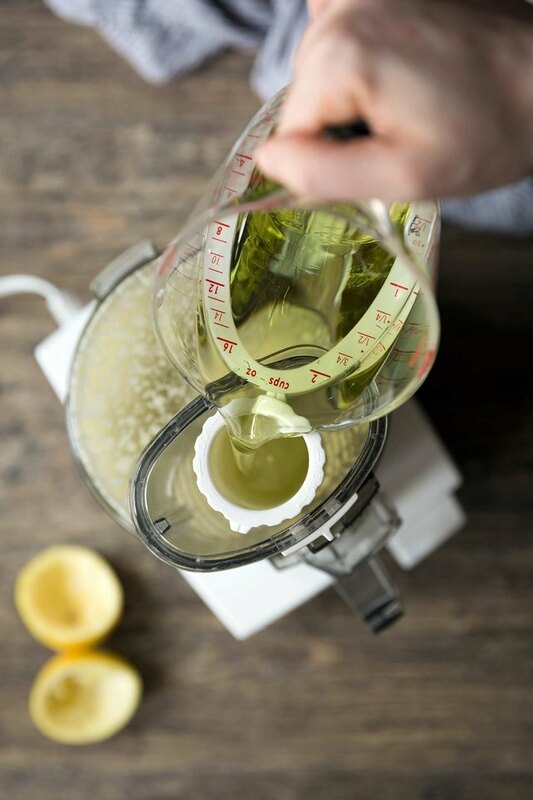 She instructs the reader to add a drop of oil at a time while vigorously whisking. I did this once, never again. 20 minutes later, my arm was on fire. Use the food processor. Lemon juice and white vinegar will both work in this recipe, but I prefer the more delicate citrus of the lemon. It's less astringent. The garlic paste for aioli was traditionally made using a mortar and pestle. Since I don't own (or need one), I use a microplane zester, the same tool I use for zesting citrus and grating nutmeg. 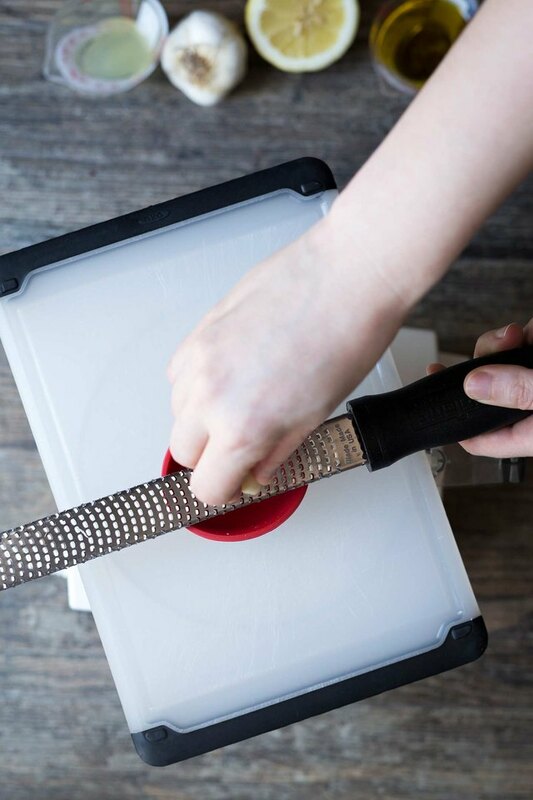 It's a fast way to get a perfectly smooth garlic paste. You can also make the paste by chopping and then mashing it with a chef's knife. 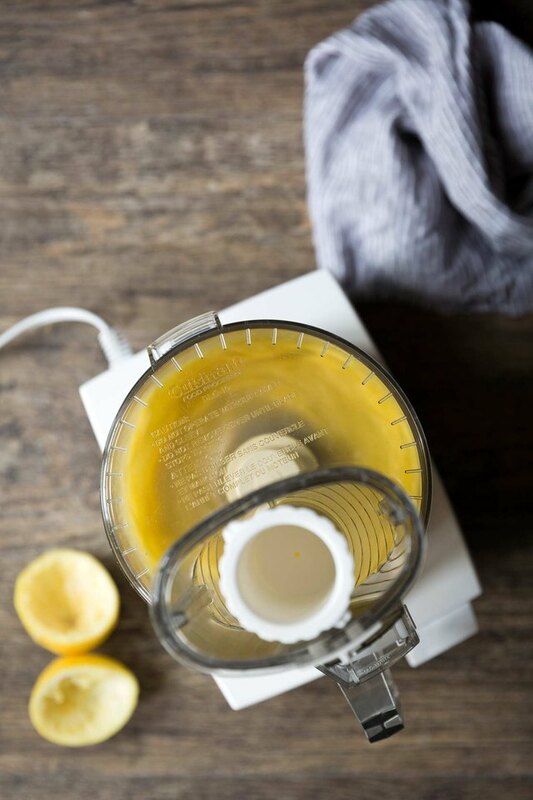 Step 2: Add egg and yolks to food processor. 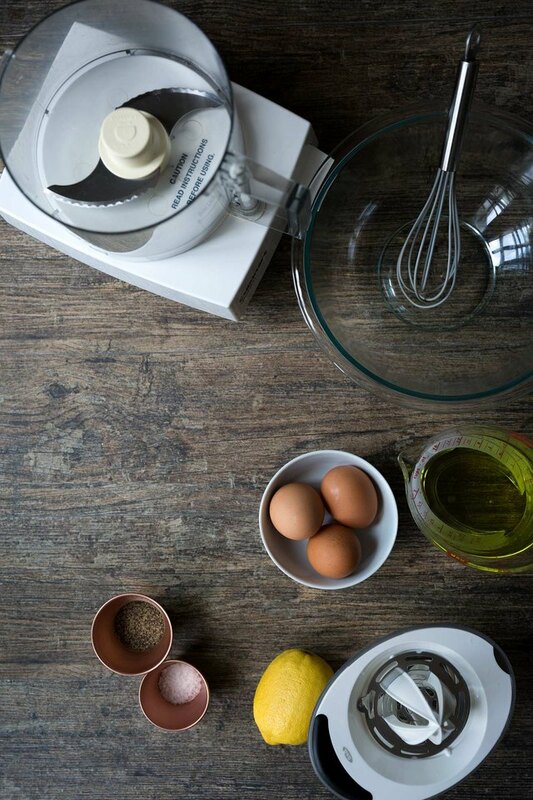 Add the egg and yolks to the food processor. Turn the machine on for about 30 seconds and puree until frothy. Step 3: Add lemon juice, salt and pepper. Add the lemon juice (or vinegar), along with a pinch of salt and pepper. If using, add the garlic paste as well. Puree for another 30 to 60 seconds. Step 4: Add the oil. Very slowly begin adding the oil while the machine is running. If your food processor's lid pusher has a tiny hole, as many of them do, you can fill the lid and let that slowly distribute the oil. Step 5: Add additional seasonings, if desired. One the oil is added, give the ingredients a stir. Add additional salt and pepper to taste, if desired. This is also when you can get creative with flavors like hot sauce, spices, etc. Store in the refrigerator in an airtight container.